By a stroke of good fortune, there was a request to subdue perytons available, so she was able to secure the rental of a dragon mount from the guild. Once she discovered the flock of birds that appeared like a haze on the horizon, she flew into them and demolished them in no time. The bodies of monsters with inherent magical powers are very useful for the creation of potions, tools and magical rituals, especially horns and antlers which are especially valuable. Since ancient times, horns have been worshipped as symbols of wisdom and power. Following the origin of the story, the first and foremost amongst horned magical creatures are dragons, who are said to store their magical energy in their horns. Likewise, for the peryton, a creature who traps its prey through its magical shadow, their magical power flows from the antlers. She cut off the three biggest antlers she could find amongst the corpses and loaded them onto the back of the dragon. Instead of packing food for the dragon, she simply fed it sections of one of the perytons she had knocked down. Shirley took its happy cry as affirmation and jumped on the saddle, when she took the reins the dragon roared and took to the sky. Her white hair rippled as they flew, the air is incredibly cold compared to the air back down on earth, but that’s no obstacle to a mother who wants to get back to her children straight away. She looked at the pocket watch she took out from her breast. She took the flying mounted dragon not just because it would be advantageous for an aerial battle, but because this fight was on a plains quite far away from that remote town and this was the fastest dragon available. Even if she’s desperate to find out the culprit, she wants to be away from Sophie and Tio’s side for as little time as possible. She’s not quite sure if she should be happy about just how much she’s changed. In the first place, she doesn’t completely trust Grania yet, it’s still possible that she’s working with whoever Shirley’s enemy is. Even so, no matter how much Shirley wants to protect her girls, as a swordsman protecting is all she can do, she’s powerless to actually solve the crime. The only solution was to borrow the power of a real mage. She regretted not ever having studied curses and suggestion magic herself. She promised herself once more. That no matter what happened, Shirley will always do the best she can for her daughters. With that resolution powering her, Shirley managed to get back to the Deficit House at 3 o’clock. When she returned to the room carrying the peryton antlers, she saw Sophie and Grania having a pleasant chat. Suddenly deciding to watch them from the shadows instead of revealing, she saw a small ball of water floating in the palm of Sophie’s hand. With Grania teaching elemental manipulation magic in such an easy to understand manner with Sophie faithfully reproducing it, they seem really happy together, like an older sister teaching the young one, or perhaps… When she imagined the other possibility, Shirley began to get upset and shake on the spot. Shirley tottered back down to the dining room like a newborn deer, not exactly living up to the moniker ‘Demonic White Sword’. Although the skilled warrior seemed completely lost for words, Martha still comforted Shirley as she raised a quivering finger and pointed it towards her room. Martha nods as she finally understood. It seems that Grania, who embodies the very picture of an adult woman, has shaken Shirley’s belief in herself as a mother to the very core. Since magic isn’t taught in school and is usually left up to the parent, Martha understands Shirley’s fretting, but still admonishes the single mother. Not just limited to magic, but handling elements, in general, can be quite dangerous, without receiving basic magical instructions one’s magical power could run amok. Small-scale elemental magic like moving water from glasses and moving wind about a room. Despite not being a professional like Grania, Shirley was capable of doing that much. It’s a little like a bartender patronizing a particularly troublesome customer complaining over their drink, but Shirley is completely serious. As a parent, it’s only natural that she wants those two to live a peaceful life rather than braving danger as an adventurer. Shirley did tell both of them that if they could pass a test at age 15, she would accept them being adventurers, but this is something else entirely. She didn’t teach her children swordsmanship or magic because she didn’t want to cut down on their future opportunities, or the dreams that might blossom for them once they grow up. Truthfully, she never thought too badly about actually having mother and daughter training sessions, in fact, the idea got her a little giddy, even if she wouldn’t admit it. But, having been beaten to the punch by Grania, Shirley’s secret desire had been scattered to the wind. Even if no one has actually done anything wrong per se, this silly parent had to retreat to the dining room to calm down and collect her thoughts. Shirley must have been really conflicted. Nonetheless, Martha pet the head of the youthful semi-immortal, who was trying her best to respect her daughter’s wishes. Shirley nodded silently. Despite being a disciple of Canary, she was relieved that the adventurer recommended by Yumina and Asterios turned out to be such a good and sensible person, although she hadn’t expected her to inflict this kind of damage on her. Looking at that face lifted her mood instantly. Sophie rushed over to Shirley, holding a cup of water in her hand. Shirley did her best to keep up her usual prudent attitude. Although it might have seemed like an awfully abrupt change to any onlooker, Shirley desperately didn’t want to show such a miserable appearance to her daughter, but Sophie is in such a good mood she didn’t seem to notice at all. Placing the cup on the table, Sophie pointed both her hands at it and began to murmur. It’s a little stilted, but it’s definitely a magical chant… It is the verbalization of the self-suggestion that can transform the world around the caster through the power of magical phenomena. The water in the cup began to vibrate on its own and eventually forms a sphere in thin air, floating above Sophie’s palm. This is 《Water Bullet》, it is among the most basic of beginner’s magic, a magic that shoots water projectiles at such strength and speed that it can even pierce iron. Sophie, who usually tries her best to act like an adult, can’t help jumping up and down with excitement as she boasts to her mother about learning her first magic. Compared to Shirley who could produce swords from thin air without chants and fought with extreme speed and strength in combat, it was a rather lousy magic, but when Sophie showed her a face full of smiling wonder, she couldn’t help but pat her head. Sophie doesn’t even try to hide how much she enjoys it when her mother stroked her soft white hair. Seeing her daughter so happy, who was she to interfere? Shirley thought that to herself with a sigh. Later that night, as Grania worked on the ritual using the peryton antlers she had gathered, Shirley stared at her from behind with those piercing red and blue eyes. She opened her mouth and spoke as if she had been mulling the words over for a while. Even if she was just killing time until she returned, Shirley still thought it was right to thank her for giving her daughter some guidance. Then, as if to ruin the moment, Grania held her hand to her mouth and laughed haughtily. Hitting the bullseye, Grania seems to be enjoying teasing the ‘Demonic White Sword’ more and more. Shirley wants to withdraw what she said before, this woman really is Canary’s disciple and relative through and through, she really should trust her instincts better. Deciding not to press her luck with the woman who so obviously wants to change the subject, Grania holds an upside-down pyramid shaped object attached to a piece of string above a sheet of parchment. Covering the dowsing tool in powdered peryton antler, it dangles above the black stained parchment that contains the sealed information of the caster. As Grania held it suspended above the darkness, the tool moves and manipulates the stain in swirls, with white light beginning to emerge. The dowsing tool and the black stain moved in tandem as if they were alive and eventually letters began to form on the page, letting Shirley see information about the abhorrent caster with her own two eyes. As if at her urging, the dowsing tool swung once more and further information appeared on the page. Shirley frowned. It’s all well and good to identify the caster, but now there’s apparently a mastermind as well? The Imperial Capital. More than anything else she’d heard about the caster, that news shocked her most of all. For anyone keeping track, that’s the 100th chapter released on this blog. Yeah, I know, don’t rub it in. Nah, if I were you and I tried to focus on one series alone, I would do much worse than I did 20. Rip caster, soon to be kidnapped and tortured by doting mother. Doubt shell leave her kids more than 3 days to do it tho. Thanks for the new chapter! Congrats on translating 100 chapters! Variety is the spice of life. There is nothing wrong with releasing as consistently as you do on several stories. Really, it’s actually just awesome and should help reduce your risk of burnout. My thoughts exactly. While they may decide to eventually prioritize a novel or two, having the others around still makes for a nice change of pace rather than being monotonous. I give the Empire 2 days. Momma Shirley won’t likely be able to resist being away that long. That’s assuming she doesn’t go full Demon mode and extends the suffering to 2 weeks of hell. 1 day to actually ruin the Empire; 13 days of painful torture to both her sister and ex-lover for daring to harm Sophie and Tio. The empire succumbing to Shirley or Shirley succumbing to daughter deficiency, what will happen first? I bet the empire succumbing to Shirley happening first. We caught a glimpse of how vicious her vengeance can ride her. And while she gave it all up upon seeing her daughters for the first time, they’re now being threatened, and until that threat is neutralized, she’s likely to give it her all until there’s no way for that threat to return. I mean, she’s already close to that bloody limit every time she’s learned about boys showing more-than-friends interest in her daughters (compared to the Minotaur who greeted them cordially and like a friend or uncle-figure). Poor Shirley, her first was stolen. First time teaching cute daughters about magic, don’t think something else. It seems only Sophie was taught, so Tio might be her salvation. Now I realize those Perytons had antlers. Birds with antlers? The heck? How do they look? Most images on the internet look more like a winged buck, not a bird. Ah whatever, they be dead. Thanks for the chapter, and congratulation on the 100th! The author very specifically uses the word bird, so the best description I can give is “A bird like creature with bronze wings and the head of a stag.” I don’t think there’s a specifically agreed upon design for a peryton and they’re a pretty obscure fantasy monster. So going by the wiki page, I guess they can be full on birds with stag heads, or stags with wings? 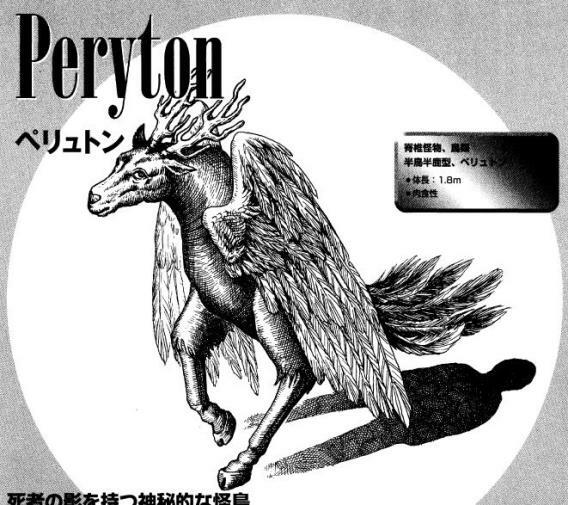 This is the image I found searching for Japanese interpretations of a peryton. By the way, yes, it’s part of the peryton legend that they cast a human shadow. That might be where this author got the idea of the peryton binding people in their shadow. Uuuuuuuuuuuuuuuuuuuh… where’s my carnage, I hope there’s full blown vengeance and savagery. The Empire deserves it. Thanks for the chapter. This series ended up catching my attention the most of late. Thanks for the chapters, congrats on the 100th. Hopefully by 200 I will actually learn how to edit. Thank you. Mama bear will set her sight on this sucker and force him to confess the mastermind, but I think it is very likely to deduce the person who would know she had children. I foresee a second coming of the white haired demon legend in the empire again..
Esse foi um capítulo interessante quero saber como a irmã do imperador vai agir e como a história segue e muito obrigado.